A high number of patients who present to the hospital emergency room (ER) with suspected heart problems fall through the catchment for acute coronary syndrome because it is not immediately detected with current tests. ER physicians require a rapid and accurate method to determine which patients require immediate life saving medical treatment. The ED team will take a small blood sample from the patient. This will then be analysed using standard hospital laboratory equipment and the reagents supplied by Upstream Medical Technologies. The results will quickly and accurately inform the emergency physician and cardiologist as to the best treatment for the patient. 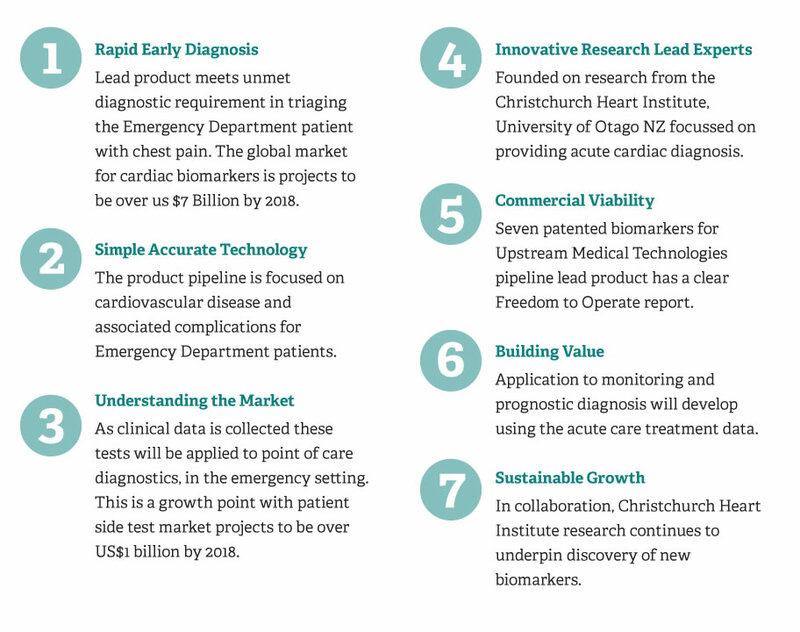 Based on many years of research, the first of our new class of biomarker-based diagnostic tests can detect imminent heart attack BEFORE tissue damage occurs, increasing survival rates and leading to improved patient recovery. Incorporated in 2015, Upstream Medical Technologies aims to create sustainable value via a diagnostics platform that uses patented technology based on specialist protein peptides (so called signal peptides) from an internationally renowned research group. 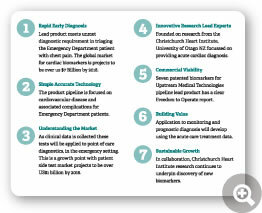 Our pipeline of tests enable earlier diagnosis for improved patient recovery. 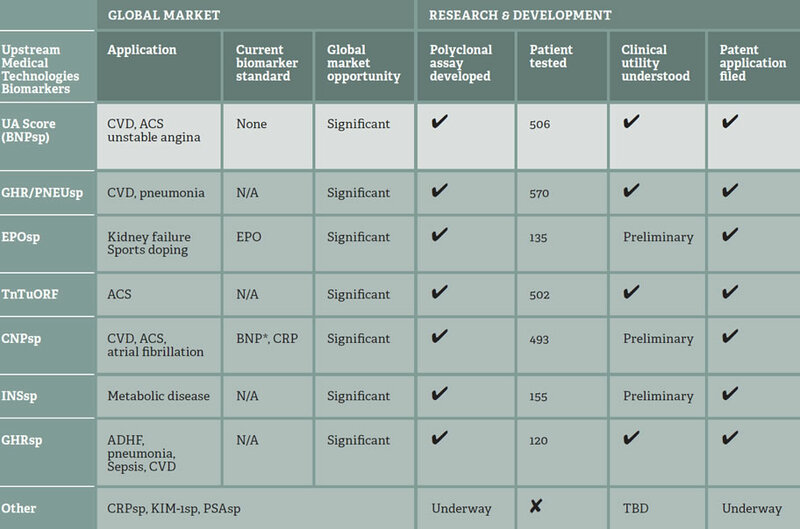 The company has seven patented biomarkers in the product pipeline all focused on diagnosing cardiovascular disease or disease that can lead to cardiovascular complications. 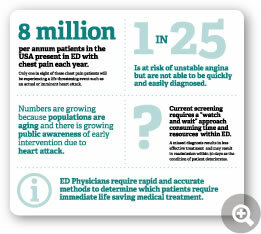 The lead product, UA Score, diagnoses unstable angina. This is a life threatening condition that can lead to heart attack. UA Score is already clinically tested in a 505 patient trial and demonstrated a 98.4% negative predictive value as a rule out test for unstable angina (Pemberton, CJ (2016) Clin. Biochem. 49; 645). The second product in development is Ghr-sp-Pne. This is a ghrelin signal peptide test, a 570 patient trial demonstrated the ability to diagnose heart failure with co-present pneumonia, in a rule out test with an negative predictive value of 99.4%. Heart failure frequently results in comorbid disease states, reaching the correct diagnosis can be complicated by more than one disease being the cause of the symptoms. Being able to diagnose both disease states results in better health outcomes for the patient and reduces costs for the hospital and medical insurer. Biomarkers of disease that can lead to cardiovascular complications include INSsp for diabetes and EPOsp for kidney failure. Additionally, EPOsp in conjunction with the World Anti-Doping Agency has demonstrated ability to test for drug doping with Epogen.